Adorn your Christmas tree with these beautiful handmade Christmas ornaments. These easy to make ornaments will hang on your tree for generations, or you can wrap them up for personalized, homemade Christmas gifts. Heavy scrapbook papers transform into Christmas ornaments to hang on the tree, on gifts, or a banister. Cut patterned cardstock into twelve 1x6-inch-long strips. Loop each strip in half, patterned side out. Glue the ends together. 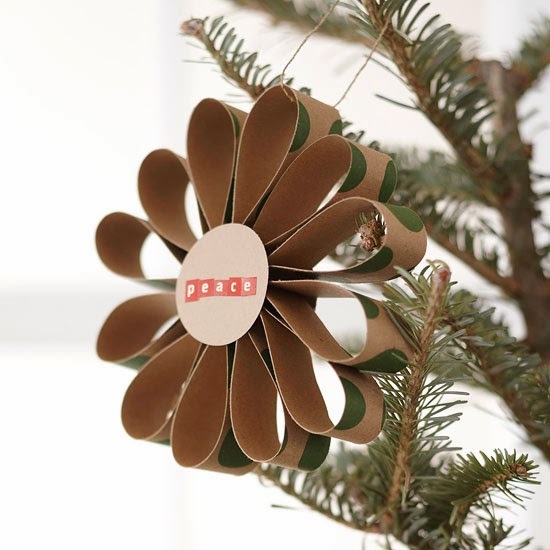 Punch two circles from solid cardstock and attach to the front and back center of the ornament. Add sticker letters and a twine hanging loop to finish. Make the cookies of the season last longer by creating a few decorative versions from clay. 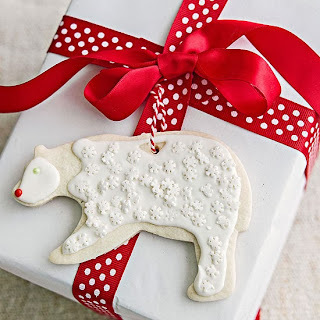 Soft modeling clay works with your cookie cutters just like dough; use a straw to create a hanging hole and bake according to package directions. Paint subs for icing, but your favorite cookie-decorating essentials (such as sprinkles) work great as ornament embellishments. Note: If you use edible items, you should not keep the ornaments after the season. 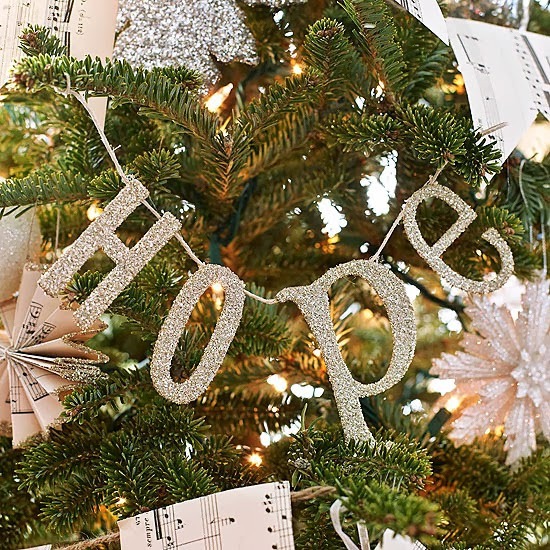 It's simple to create your own ornament message for the holiday tree (or a mantel or window). Choose chipboard letters that spell a word or message. Coat with glue and glitter, then string on hemp twine. Use felt and a miniature embroidery hoop to create a set of cheery snowman Christmas ornaments. Cut a piece of ivory felt for the background (make it a bit larger than the hoop). Cut a smaller circle of white felt for the snowman's face. Using a fabric pencil, trace a mouth, nose, and eyes. 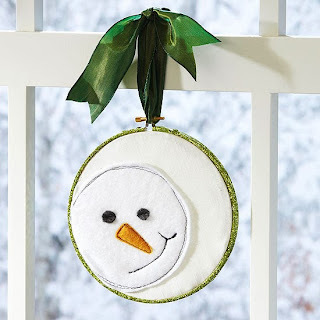 Using a sewing machine or hand needle, stitch around the edges of the snowman's head and to outline the mouth. Cut small pieces of black felt for the eyes and orange for the nose; stitch or glue in place. Paint the embroidery hoop and dust with glitter; let dry. Position the finished piece inside the hoop; tighten and attach a wide ribbon at the top for hanging. 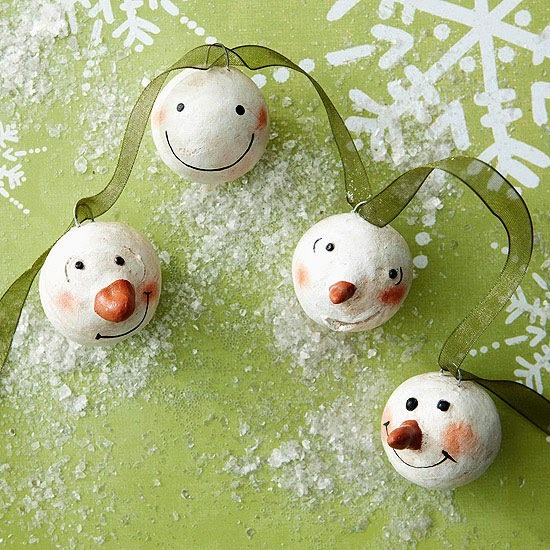 Whip up a batch of these mini Christmas ornaments; hang some from the tree and give a few as gifts, too. Simply trace a design onto a small piece of brightly colored linen or cotton. 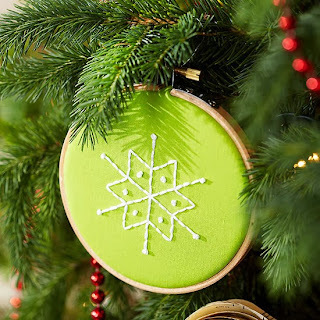 Embroider the design, then place in a miniature embroidery hoop (use hot glue to seal the edges). 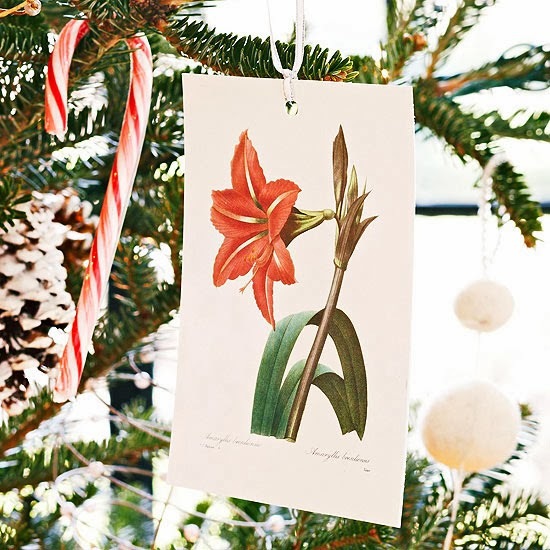 Use beautiful cards or postcards depicting favorite scenes, places, or plants as decorative Christmas ornaments for your tree. Simply punch holes into the tops and string with ribbon. It's easy to assemble a whole garland filled with these happy snowman faces. Start with small foam balls; cover with air-dry clay, adding an extra-small amount to each to shape into a nose if desired. Wet the clay to attach black beads for eyes; use a toothpick to draw mouths. Paint facial details with orange paint, or add a bit of cosmetic blush for rosy cheeks. Add a hanger using an 1-1/2-inch-long piece of florist's wire. Seal with clear gloss gel medium or clear glitter paint. 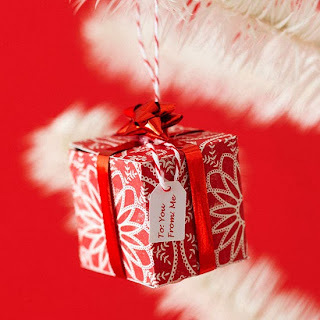 Hang a few of these neatly gift-wrapped box ornaments in addition to the presents sitting underneath your Christmas tree. Die-cut a box shape from heavyweight patterned paper, then fold and assemble to make a cube. Pierce a small hole at the top of the box. Loop baker's twine through the hole and tie a large knot at the end; thread the loop through the hole in the box top. Adhere two pieces of curling ribbon and a bow; dangle a tag from the ribbon.